Where to Buy Drexel X 28-0-0, Drexel X 28-0-0 72% SRN Liquid Fertilizer - 2.5 Gal - $63.95 for Sale with Fast Free Shipping! Drexel X 28-0-0 72% SRN Liquid Fertilizer - 2.5 Gal is a clear liquid fertilizer deriving its slow-release properties from Triazone nitrogen with 8-12 weeks esitmated release pattern. X 28-0-0 contains 72% slow-release nitrogen (SRN), increasing nitrogen absorption/uptake and reducing volatility and nitrogen loss, thus allowing for a highly efficient use of nitrogen. X 28-0-0 is a high quality, controlled release source of nitrogen. X 28-0-0 is well suited for formulating fertilizer blends and is compatible with many phosphorous, potassium and micronutrient sources. 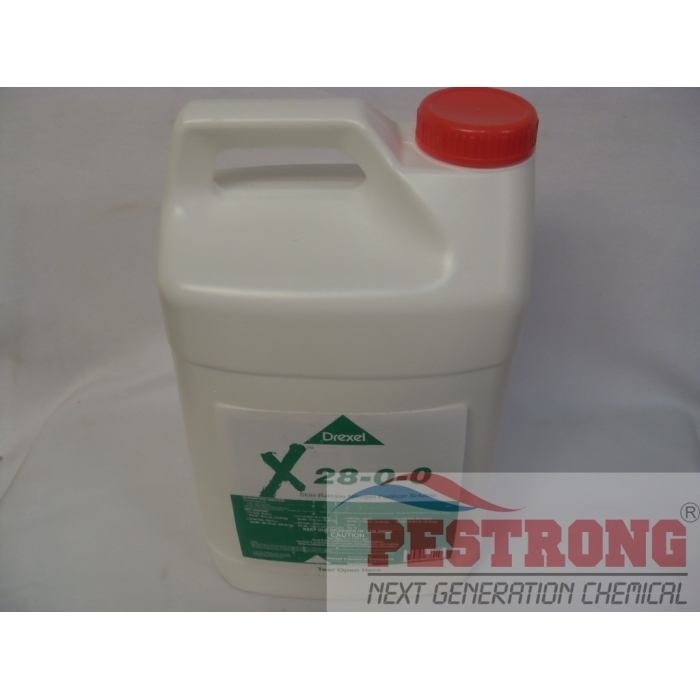 X 28-0-0 is an excellent carrier for many crop protection products. X 28-0-0 resists drying out, increasing plant safety. X 28-0-0 provides exceptional translocation within the plant and has low wash off potential. X 28-0-0 is easy to use and cost effective. X 28-0-0 has flexible rates to fit your fertility program and timing. X 28-0-0 has a low salt index compared to other nitrogen forms. Slow release product that gets the job done. It takes quite a while for it have a noticeable effect, but patience is rewarded. I started noticing a small difference a little over a month. And after 2 months. I started to see significant changes. Purchased 5 gallon's. sprayed about 1 1/2 acres with pull behind sprayer. its been over 3 weeks now. Not much change. I know its says slow release! but I think it should show some signs after being down for almost a month. I will try the other liquid fertilizer next round.